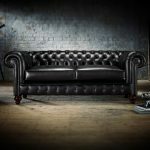 Sofas by Saxon are specialists in creating handmade bespoke furniture. All of Sofas by Saxon’s products are created from scratch, by hand at their workshop. Sofas by Saxon’s sofa and chair frames are made from solid beech hardwood, using traditional joints, strengthened corners and robust suspension. Buttons and studs are all individually hand-tacked. Leather is only sourced from entire cowhides from the best Italian tanneries. Fabrics include wools, tweeds and linens woven and finished in Britain, and velvet from Italy.